Hello loves, how was your weekend? Mine was lazy + fabulous. Except for that stinky time change of course. Meh, don’t like that. I did finally get my curtains hung in my new room so that I can sleep all night though. That was especially nice. 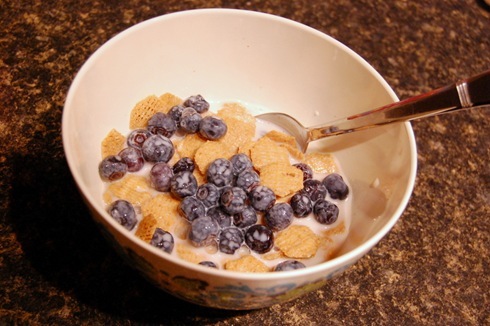 I made it easy on myself this morning and used up the last of my wilted blueberries in a bowl of Barbara’s Shredded Spoonfuls with almond milk. I was using soy milk of late because it was on sale, but I picked up almond milk this week. I swear I have used almond milk in my cereal before, but this was disgustingly thick. Has anyone else ever noticed this or did I perhaps get a bad box of almond milk? Oh well, I ate it anyway. And two cups of coffee. The large ones. It is now Daylight Savings Time after all and it takes me a week to adjust. Laugh if you want to. Sweet potato fries are always fantastic of course. 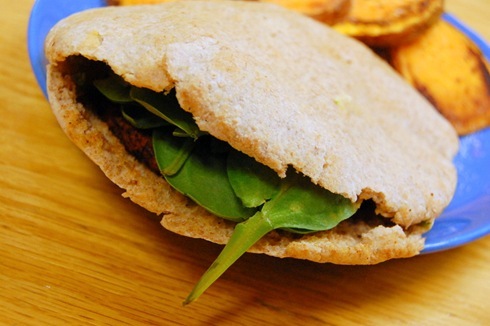 But the kicker was this pita sandwich I made. 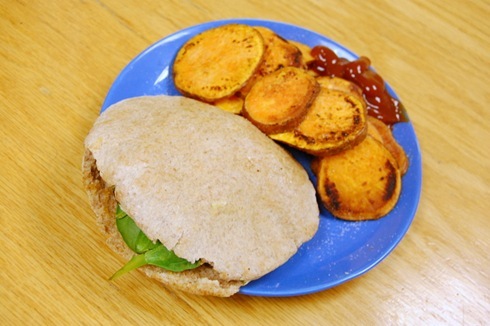 A Morningstar Farms burger with spinach and TJ’s triple layer hummus. Don’t judge if I eat this again tomorrow. 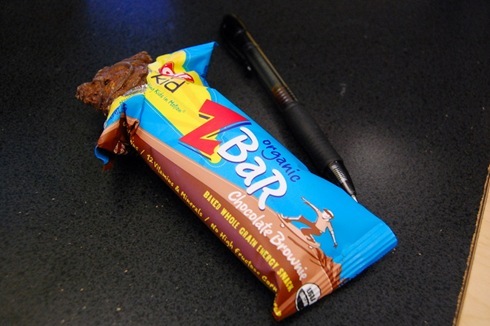 I was SO BUSY this afternoon, I barely got a chance to eat this Z-bar on the fly. Obviously. I didn’t even move my pen. I love those pens, btw. They always disappear on me too. 😦 The good ones always do. After work I hurried home because the ONE good thing about DST [Daylight Savings Time] is that it is light outside until 7:30, so I got in a good run plus a gym session, by RUNNING to my gym, working out and RUNNING back. It felt SO GOOD to run outside again. It was like 64 degrees. PERFECT, PERFECT running weather. I have to be honest, between the HORRID burnout I suffered + my post marathon injury I had let my running slide. A lot. Today was good, because it reminded me why I love to run and why I signed up and ran that marathon. When it’s right, it’s just RIGHT. Unfortunately, my lack of training means that I probably will not be doing the Charlotte Racefest Half Marathon. I just don’t see myself being ready for it. I am though, going to go for the 10k. I haven’t done that distance before and I think it will be a good race to get me ready for some late spring/summer half marathons. I was in the mood for PROTEIN for dinner, so I fished [oh this is good…] some tilapia out of the freezer that I bought on sale the other week and pan fried it in some olive oil. 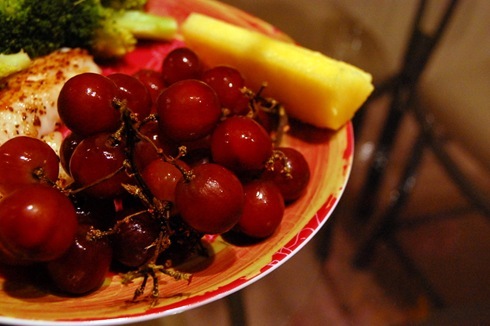 and some grapes that were on their last leg along with some pineapple that I picked up at TJ’s this weekend. Looking pretty at the table. But in fact eaten whilst watching old Grey’s reruns on Lifetime. I do think that eating in front of the tv is not optimal, but these days I eat by myself 95% of the time and it’s lonely to eat at an empty table. Much more exciting to dine with Dr. Miranda Bailey and Meredith Grey. CharlotteOne from last week, Legalism vs License. 😦 I’m sad you arent’ doing the half marathon, but admire the fact that you admit you aren’t ready. Last year I had to eat by myself a lot, and Grey’s Anatomy was my go-to show, too! And those sweet potato fries look awesome! “The good ones always do” – So true! your comments made me SMILE!! i love you girl! love those sweet tater fries. i must watch that sermon! gah it sounds so unique and interesting! Do. You are so sweet. 😀 love ya! And LOVE the shredded spoonfuls! I need those back in my life stat. 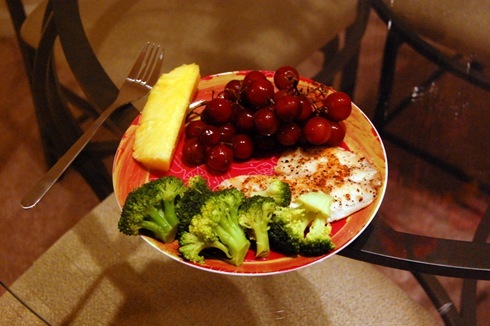 Did you use any seasoning on the fish before you cooked it? Or just salt and pepper? I’ve been eating a lot of fish recently, partly since my gastroenterologist has me on a very restricted diet (no gluten, dairy, soy, nuts, oats, legumes, fruit (except fresh tomatoes), and no vegetables except for lettuce, carrots, parsnips, celery, white potatoes, and small amounts of broccoli — what do I eat, you ask? Indeed.) and I’ve been tending to just sprinkle over salt and pepper, then a bit of lemon juice. I haven’t experimented with any spices or herbs, because I’m not quite sure what would be good. Salt, pepper and a bit of Grillmasters Montreal Steak seasoning. Use that on EVERYTHING. I had sweet potato fries for the first time today and am officially obsessed!!! I totally agree that we’re having perfect running weather in CLT lately- thank goodness!!! My almond milk poured out of the container today into my coffee all chunky. Blech. I think it was because I didn’t shake it well enough since it tasted fine. Perhaps that was the problem? Your dinner looks so good! 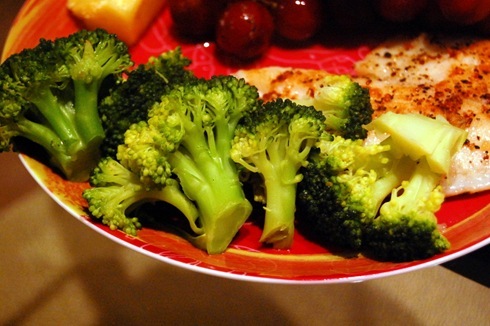 Steamed broccoli is my all time favorite. I hate waking up to the time change myself. But, I love the longer daytime hours. I often switch between soy and almond depending on which is one sale and what I have a coupon for. I definitely enjoy the ALmond the best, but sometimes Soy is a nice change. ick, thick almond milk? sounds dank. toss it, ma! p.s. not quite sure if dank has a good connotation or not – I always forget. Regardless, I meant it sounds no bueno. This milk was dank. I know what you mean, dear. Oh girl, I hate hanging curtain. Props to ya for that! i always eat in front of the tv, even when my roommates and i eat together! the dining room is too formal after a long day of work, sometimes you ust gotta lounge. SS+AM is probably my favorite thing to eat, ever. no really, it is MY FAVE! TJs triple hummus is the bomb.. i wish i had a TJs!! great eats, my dear! Wow. It’s crazy how similar our eating is! I love morningstar farms burgers. Love making sweet potato fries like yours (although my husband likes them crispier, almost like chips), I thought I was the only adult who ate the choc brownie Cliff zbars and I made fish last night very similar to what you made! Too funny. You can never go wrong with sweet potato fries… Especially curry spiced fries LOVE! 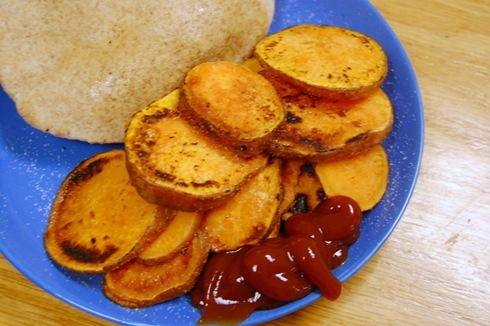 Sweet potato fries look great! I always seem to be losing pens as well! 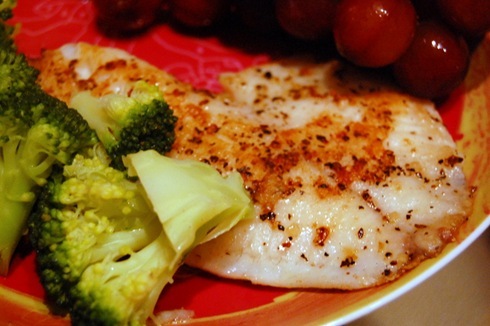 How does the frozen tilapia taste? I would be interested in trying some of that action. I only ever eat frozen so I would not be a good judge, me thinks. Good? I would not eat it if I did not think it was good. I think that for the almond milk you may have just gotten a bad carton or a bad brand/flavor. I find that some almond milks are better than others and it just means you have to experiment a little. 🙂 Your dinner of fish looks really good! If I am not working, most of my dinners are either in front of the tv or computer! We know how it is 😉 Although, I am def craving some sweet tater fries now! I ran in the sun today too. Another awesome thing about spring is that the sun sets later thus making running outside at 7 pm possible! A run in nice weather is soooo much better than in the winter! That bar sounds yummy! And I love that you’re a fellow Greys lover! I am waaaay too particular about my pens and notice my favorites always disappear, too. What’s up with that?? Pen elves maybe? ?